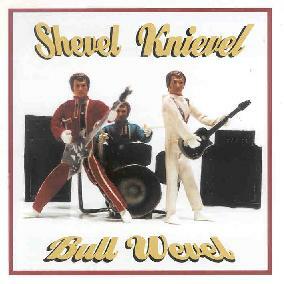 Shevel Knievel - "Bull Wevel"
This is a self released CD by a strange Oakland band that describe their music on their web page as SlagRock! The band are a three piece with female bassist and vocalist. The instrumental "Trinity" opens the CD and is a very raw song with incredible distortion guitar. "Get Your Hands Off This Is My Beer" is next and has a down and dirty snotty punk attitude. I am guessing these folks have seen a few shows at the Gilman Street in Berkeley, a place I used to frequent and you could catch bands playing bizarre freak rock like this. The majority of the songs on this CD are under 3 minutes as the band try to keep your attention with their ever changing strange repertoire of songs. I am not sure what to think about this. The last track on the CD, "3PC", is 13 minutes and but after the 4 minute song you have a few minutes of silence and then another real song with really funny lyrics. Then some more silence and at the ends some guy just freaking out. Bizzare. The CD booklet is quite humerous to read. If you don’t know what Slag Rock is then you need to hear this CD. My only fair advice about this CD is don’t get stoned and listen to it... you could be damaged forever! For more information you can visit the Shevel Knievel web site at: http://www.shevelknievel.net.